This amazing dirt road winds high into the front ranges of the Canadian Rocky Mountains. From a pulloff, I could get out of my van and see way down into the valley where I was just 15 minutes before. The autumn colours were fluorescent in the morning light, so I used a long telephoto lens to isolate this scene. Nikon D7100, tripod, 70-300 mm. lens, polarizing filter. 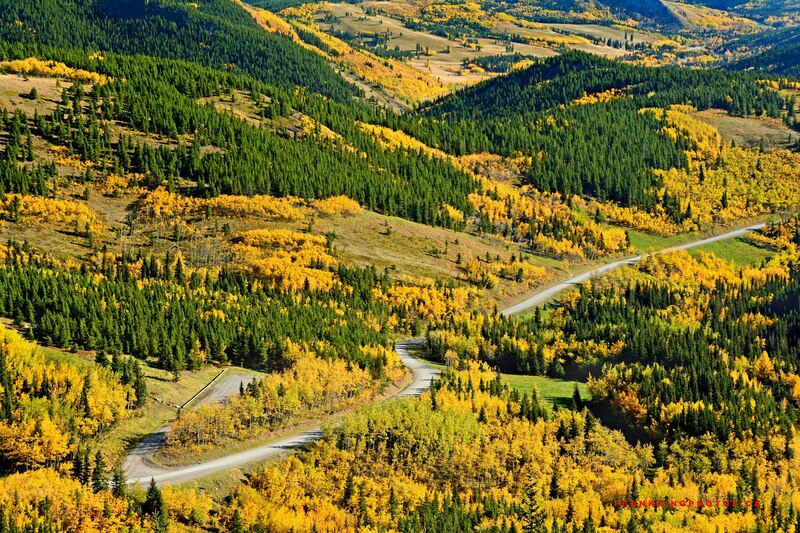 Are these Aspens or Larches that create this fantastic yellow panorama? This is a wonderful overview, especially helped by the diagonal track of the road. Great shot, Frank.